Yoga Nidra is a lying down, guided meditation. It is a deeply relaxing therapeutic technique. 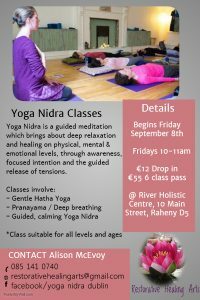 A Yoga Nidra Class involves gentle yoga stretches, deep breathing and a deeply relaxing yoga nidra practice. 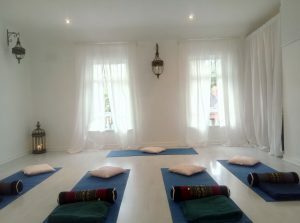 Through initiating deep relaxation, generating soothing brainwaves and energizing the nervous system, yoga nidra works holistically on body, mind and spirit. Cost ~ Drop in €15, 6 week term €60.